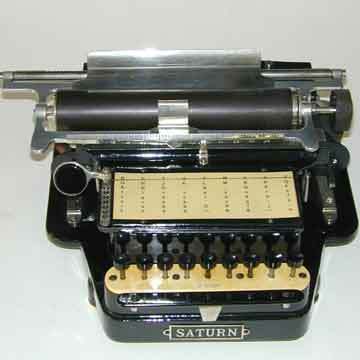 The blind writing Saturn is one of the most impractical machines ever, built with proverbial precision in Switzerland. The Saturn has only nine U-shaped type bars, four on each side under the carriage and the ninth swings up from behind, exactly in the middle. Writing was blind. Each type bar holds eight characters, which are by moving a wire across the index card with the large selector button on the left. Typing was done by hitting the corresponding key, of which there were nine. The lower case characters were laid out differently from the capitals, making work on the Saturn even more complicated. See the book TYPEWRITER, page 156.